This week I've been outside walking through the Chicago Botanic Gardens, going to the farmers market, and making my daily trip to the shop. I love the fall breeze and this week all I have been thinking about is light sweaters, and fall shawls. I have put together a few designs that makes me wish I had all the time in the world to make sweaters! I hope you enjoy and are inspired to start this new season with a cool breeze and warm heart! This simple pattern makes this delightful shawl perfect for the fall leaves. I picked out Peppino by Rhichard Devrieze in Roasted Arabica. This beautiful mix of earthy tones brings out the the fall colors as you head to work, or run errands! 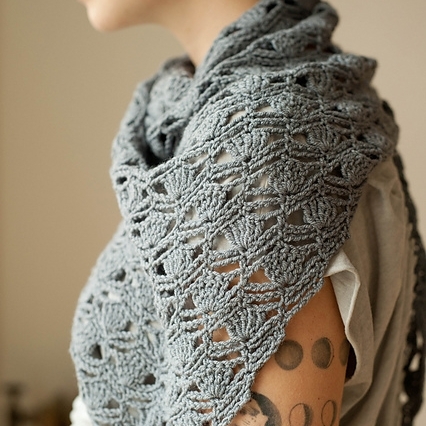 This light shawl is delightful dressed up, or down. A lovely yarn for this pattern would be Smitten by Why Knot Fibers in Ripple. Just like the ripples in Lake Michigan, this shawl adds beautiful texture to any outfit. 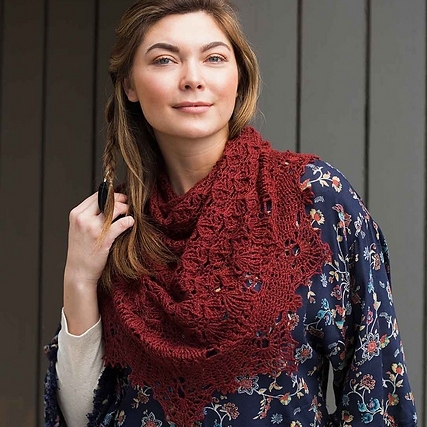 For those of you who want to welcome the Fall with a more challenging pattern, this lacy shawl will not disappoint. This shawl will need more focus, but it'a beauty will make it a delight to crochet and wear! The deep purple of Savor by Why Knot Fibers in Orion, reminds me of the purple maples in my neighborhood where I grew up, and it compliments any fall color palette. This sweet sweater is a perfect garment for this in-between weather. Dress it warm, or cool, it makes a statement with any outfit. I was drawn to Sole by Why Knot Fibers in the color In the Rushes, a beautiful green yarn that mimics the deepening of Summer into Fall. I hope you enjoyed this week's pattern inspiration! Happy making!